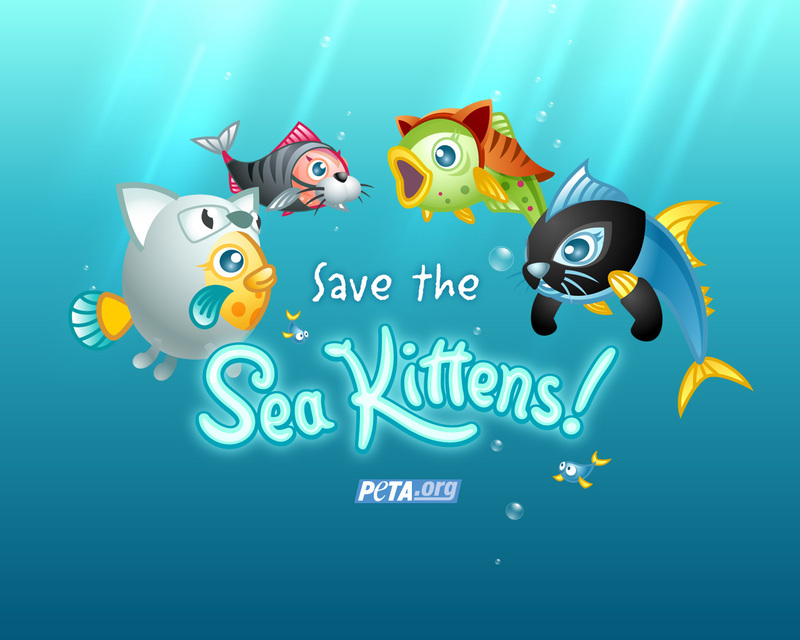 Sea Kittens: Because Nobody Hurts Kittens? So I could probably just fill this blog entirely with PETA ads, but I’ve mostly avoided them because it’s kind of a bottomless pit of bad advertising and for the most part doesn’t require much comment. They do have a recent campaign, however, that I felt deserved to be posted. Historically, renaming things to improve their appeal is pretty common. Usually they are being renamed to get people to be more interested in eating them, though, not… cuddling them? To be honest, I’m not entirely certain what PETA hopes to gain from this campaign. People don’t seem to like fish. They’re slithery and slimy, and they have eyes on either side of their pointy little heads—which is weird, to say the least. Plus, the small ones nibble at your feet when you’re swimming, and the big ones—well, the big ones will bite your face off if Jaws is anything to go by. Of course, if you look at it another way, what all this really means is that fish need to fire their PR guy—stat. Whoever was in charge of creating a positive image for fish needs to go right back to working on the Britney Spears account and leave our scaly little friends alone. You’ve done enough damage, buddy. We’ve got it from here. And we’re going to start by retiring the old name for good. When your name can also be used as a verb that means driving a hook through your head, it’s time for a serious image makeover. And who could possibly want to put a hook through a sea kitten? Point number one: I think the problem is actually that people do like fish – they taste good. There are whole restaurants designed around serving them as fancy food. If people didn’t like to eat them, PETA would have less of a problem with the whole fish thing. Point number two: The “sea kitten” thing is weird on multiple levels. First of all, fish dressed as cats (and elephants and whatnot, which is even weirder and makes even less sense here) is a little strange and I’m not sure how it’s supposed to make me sympathize with them any more. And are these just baby fish? Are there sea cats? Or are all fish babies (kittens = baby cats)? Because that’s confusing. Especially since those don’t look like any baby fish I’ve ever seen. Seriously, if you wanted a “save the fish” theme, talk to Pixar and hire Nemo as your spokesperson. I’d run screaming from a “sea kitten”, but I would never hurt Nemo. Point number three: Who thought bringing up Jaws was a good idea? Fire that guy. I think I liked fish better before I visited this website. But it did make me hungry. Strangely, many PETA ads and websites have that effect on me. Since they usually make me hungry for whatever they’re telling me not to eat (in this case, I’m sort of craving salmon in a buttery sauce), they might want to work on their techniques. This entry was posted on January 2, 2010 at 12:00 pm	and is filed under Advocacy. Tagged: animal, peta, website. You can follow any responses to this entry through the RSS 2.0 feed. You can leave a response, or trackback from your own site. I had a much more positive mental image of fish before reading the first paragraph of PETA’s description. *sigh* As you say, fire that guy.